EVALUATION OF ANTIMICROBIAL ACTIVITY OF ETHANOLIC EXTRACT..
REPORT OF SOME MEDICINAL PLANTS USED IN FOLK MEDICINEIN TRIBAL..
PHYTOREMEDIATION OF OXIDATIVE STRESS BY ROOT EXTRACT..
ANTIMICROBIAL ACTIVITY OF NYCTANTHES ARBORTRISTIS..
STUDY OF ANTIBACTERIAL ACTIVITY OF CRUDE EXTRACT OF LEAVES..
ANTIBACTERIAL ACTIVITY OF PLANT EXTRACT OF Oxalis corniculata.. 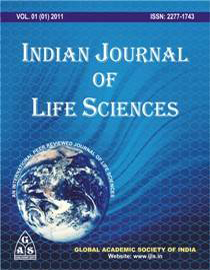 COMPARATIVE STUDY OF APPLICATION OF CHEMICAL AND BIOFERTILIZER..
TO STUDY THE CHEMICAL COMPOSITION AND CLINICAL PROPERTY..
HERBAL AND FOOD PLANTS USED BY TRIBALS AND TRADITIONAL HEALERS..
CHARACTERISATION OF PHOTOCHEMICALLY FORMED BIOMIMETIC..
STUDY OF VEGETATION IN GOVERNMENT RAJIV LOCHAN COLLEGE..
A STUDY ON BIOCHEMICAL INTERACTION OF E.coli.. RELATION BETWEEN SLEEP-WAKE CYCLE AND BODY MASS INDEX..
PHYTOPATHOLOGICAL STUDIES ON Oxalis corniculata..
EFFECT OF LIGHT EXPOSURE ON CHEMICAL PROPERTIES OF MUSTARD..